Never looked twice at a Volkswagen. Until what's-his-face started writing about that damned car. Now... I've talked my wife into looking at a house to buy, for the sole purpose of tacking this onto the mortgage. Have I ever driven a Beetle before? No. Can we really afford another vehicle that can't fit a car seat? No. Does it matter to me? Not really. 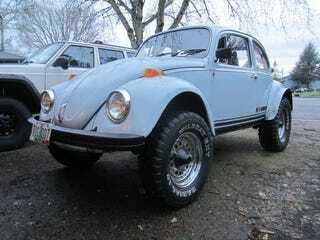 Because I see this thing for sale, and I want it so damned badly.